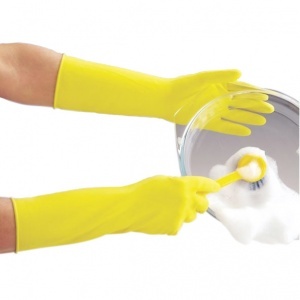 Nobody really enjoys washing up, but with the right pair of gloves a daily chore can become less daunting. 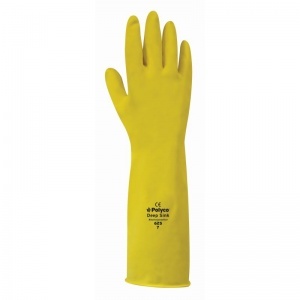 The Polyco Deep Sink Extra Long Rubber Washing Up Gloves are long gloves that are perfect for washing up. These long sleeve gloves are 38cm in length, making them ideal for washing pots and dishes while preventing water from getting into the glove itself and irritating skin. Featuring a soft cotton flock lining, these kitchen gloves for washing up are a step above a typical pair of extra long rubber gloves as they keep your hands feeling comfortable for long periods of time. If you're looking for rubber gloves for washing dishes, the Polyco Extra Long Washing Up Gloves are ideal for you. Featuring a slip-resistant pattern across the palms, the washing gloves improve your grip and therefore prevent dishes slipping out of your hands, which can in turn speed up the whole washing up process! 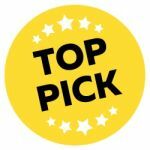 Our top pick for washing dishes; we even use them in the office! 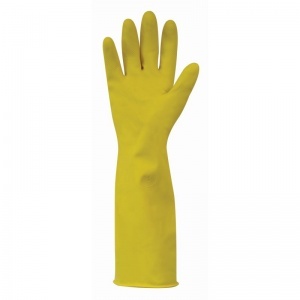 Here at SafetyGloves.co.uk, we believe that the Polyco Long Armed Rubber Gloves are the perfect pick for washing up. With their extra long cuffs and flock lining for easy donning and doffing, these long armed rubber gloves work with you to ensure you remain comfortable even when there's a pile of dishes in front of you. The soft cotton lining also helps to prevent what we've taken to calling "glove sweat," which tends to built up when you use unlined gloves. The lining itself helps to absorb perspiration to keep your hands drier for longer. The Arm Length Rubber Gloves are so good that they can even be used as industrial rubber gloves in restaurants if you're working as a dishwasher! 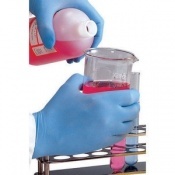 Who Can Use the Polyco Deep Sink Washing Up Gloves? The Long Sleeved Rubber Gloves are specifically designed for washing household dishes, pots and pans, but they can also be used in restaurants or for janitorial work. Owing to their extra long length, the Polyco Deep Sink Gloves prevent the ingress of water, meaning you remain dry and comfortable throughout use. This helps prevent skin irritation and damage caused by chafing and friction from wet hands. In order to select the correct size, simply measure across your palm at the point indicated in the picture and compare your measurement with the chart below. It is recommended that you use a tape measure or ruler to get the right measurement. Our measurements are based on centimetres. Where your measurement falls on the boundary of two sizes, it is recommended that you select the larger of the two sizes for a comfortable fit. 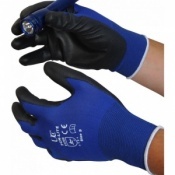 If you would like your gloves to offer a closer fit, the smaller of the two sizes might be more suitable for you. Gloves ordered easily on web. Arrived quickly and do what is required of them. Quite reasonably hard wearing for houeshold use. Unlike others, these don't leak asks they stay up your arm. Perfect! Long washing up gloves are VERY hard to find, for some reason supermarkets don't sell them, so I was delighted to find these. I will definitely buy again. Bought for my son who pot washes in a local pub at the weekends. Wearing well and good length for the deep sink. I wash dishes with hot water and I was hoping that those gloves would isolate a bit more than this.